Experts claim that Canada’s newly-elected Liberal Party government will take a softer line on issues such as the conflict in Ukraine and the fight against ISIL while making significant cuts to the defense budget. Canada’s newly-elected Liberal Party government will take a softer line on issues such as the conflict in Ukraine and the fight against ISIL while making significant cuts to the defense budget, experts told Sputnik. On Monday, Justin Trudeau’s Liberal Party won almost 40 percent of votes cast in Canada’s general election, which translates into 184 seats in the 338 seat Canadian House of Commons. “In terms of foreign affairs, I expect Trudeau to take less of a hard line against Russia in relation to the situation in Ukraine,” University of Prince Edward Island Political Science Professor Henry Srebrnik told Sputnik on Tuesday. A Trudeau administration, Srebrnik added, will also probably be less involved than Conservative Party Prime Minister Stephen Harper’s government was in fighting ISIL in the Middle East. 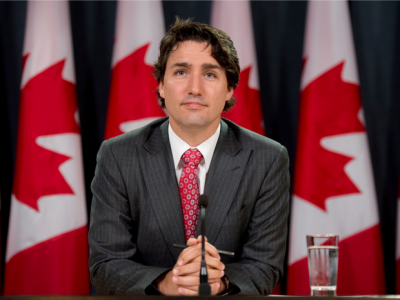 Trudeau benefited from the public’s weariness with Harper’s hardline stances, Srebrnik added, including on the place of Muslims in Canada and the wearing of the Islamic cover by women, along with one other very important factor: Trudeau’s surname.”He capitalized on the Trudeau name — his father Pierre was prime minister from 1968 to 1984, with one brief interruption — plus the fact that after nine years in office, Prime Minister Stephen Harper seems to have outlived his welcome,” Srebrnik explained. Centre for Research on Globalization Director Michel Chossudovsky told Sputnik that there is a general sense of relief among Canadians after the election. The relief, Chossudovsky noted, can be attributed to the fact that Harper’s conservative government has been replaced after ten years of implementing a policy agenda that appeared to be a “copy and paste” from Washington’s handbook, including on national security issues. The Liberal Party’s campaign platform, Chossudovsky observed, was based on key issues such as increasing deficit financing while downsizing the defense budget, which encompassed slashing procurement of the F-35 fighter jet. “They [the Liberal Party] also want to discontinue the F-35, a fighter jet program which was a tremendously expensive undertaking,” he argued. Chossudovsky also underlined, however, that despite the less hawkish tone, the Liberal Party will still converge with the United States in many areas, including trade and foreign policy, up to a certain point. On Tuesday, Trudeau said that Canada’s Liberal Party would end the country’s participation in airstrikes in Syria, but will do so in an orderly manner. On Tuesday, US State Department spokesperson John Kirby told reporters that the newly-elected Canadian government will have to determine if it wants to continue supporting US security policies in Afghanistan and the Middle East. The US Defense Department, for its part, said it looks forward to continuing its strong defense relationship with Canada.